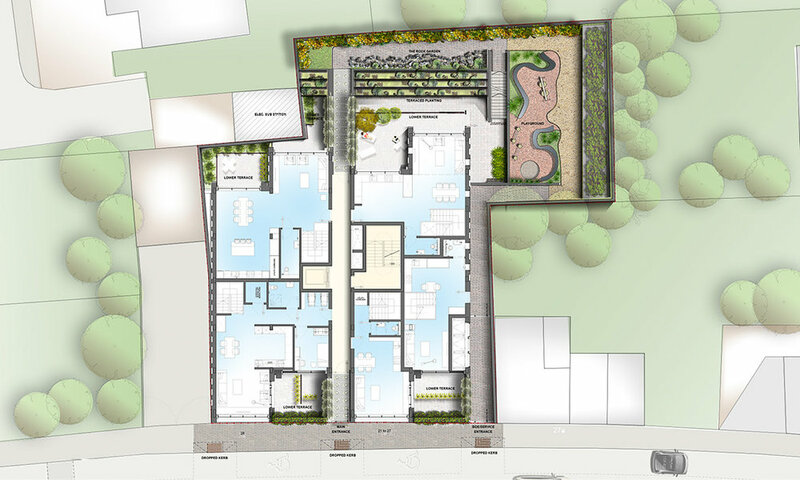 The proposed redevelopment has been designed in accordance with the most up to date accessibility regulations and standards, achieving a fully accessible and compliant building and includes the erection of a residential building block on 3 levels and a Lower Ground level, providing 17 flats providing high standard accommodation. The building massing is a direct reflection of the pattern and scale of the surrounding buildings, designed to minimise a negative impact on the adjoining properties. The building benefits from a well landscaped defensible space to the street junction, providing protection and privacy to the ground floor apartments. Residents will benefit from an extensive landscaped communal area at the rear of the property, including safe play and seating area, terraced planting and bicycle storage. The concept for this site, located just behind the busy Norwood Road, part of a current Local Authority regeneration zone, is to create a subtle addition to the local streetscape and regenerate a dilapidated pair of buildings. At the heart of the design strategy lies the determination to realise the full potential from this challenging brownfield site while taking into consideration several constraints due to nearby properties. Dalton Street is a quiet backstreet who’s main purposes serves as an access point to the shops on Norwood Road, as well as the apartments above. The rear facade of these properties subsequently forms a saw tooth along Dalton Street creating an inconsistent building line. Our proposal seeks to balance the scale of these properties and complete the residential parcel formed between Lancaster Avenue and Chatsworth Way. The building will become the keystone along Dalton Street.